Other mistake: While in the past on the Jocacean Memorial Planet, after Dacon is sent up on the wall by his commander, when the Venek Horde are coming over the wall Aeryn pulls one down and throws him to the ground, and we can see one of the armor pieces lying on the ground with the actor name "Dacon" written on the inside in English. Trivia: While they're waiting for the Venek Horde to attack again, when John's chained to the statue Scorpius/Harvey's playing the harmonica with his feet up on John's lap. Notice that both soles of Scorpius/Harvey's red boots have the name "Andy" written on them. In "Toy Story" Woody's boot has "Andy" written on its sole, and here in John's mind it's to signify John's ownership of the neural clone. Trivia: In at least series one, the ships "throttle" control for the non-pilot crew is a painted Logitech Trackball. Trivia: Over the course of the four seasons, D'Argo's face mask / make-up changes considerably. First season, his face was a dark beige colour, and his nose was very obviously just stuck on. Three seasons later, his face is brown with a reddish tint, with much rounder features. John: It's kinda like Louisiana. Or Dagobah. Dagobah...where Yoda lives. John: Just a little green guy...trains warriors. 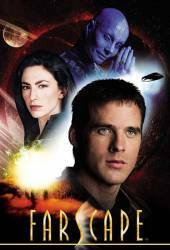 John: I'm tellin' you Aeryn, it was from Earth. A television transmission. Aeryn: What? You mean, like that Yoda from Dagobah? John: No, no, no, no, no! Three Stooges, wub-wub-wub-wub-wub.